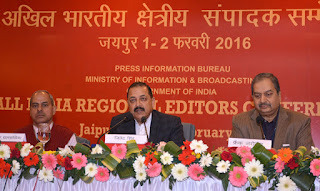 The Union Minister of State (Independent Charge) for Development of North Eastern Region (DoNER), MoS PMO, Personnel, Public Grievances, Pensions, Atomic Energy and Space, Dr Jitendra Singh addressed the All India Regional Editors Conference at Jaipur today. · The Government has announced setting up of a Centre for Film Production, Animation and Gaming in Arunachal Pradesh for the North-Eastern States. · 18 new FM Radio Channels approved in addition to 12 existing channels. 3 FM channels each will be launched in six towns of Assam, Meghalaya, Mizoram, Nagaland and Tripura. · National Highway and Infrastructure Development Corporation (NHIDCL) set up in July, 2014, has opened branch offices in all the States. Work in progress on 1000km road length in Assam, Arunachal Pradesh and Tripura, including Numaligarh – Itanagar connectivity and Agartala – Sabroom. Work to commence shortly on 4-laning of Dimapur – Kohima, Imphal – Moreh, Aizawl – Tuipang, Shillong – Dawki, alternate highway in Sikkim from Bagra Kot to Nathula Pass via Pakyong. · Arunachal Pradesh and Meghalaya put on the railway map. · The Prime Minister Shri Narendra Modi flagged off the first train on Dudhnoi – Mendipathar railway line on 29th Nov., 2014 and connected Meghalaya with the Railway network. · The Prime Minister flagged off an AC Express between Naharlagun and New Delhi; and the Inter-City Express between Naharlagun and Guwahati, on 20th February 2015. · Setting up of North East Brahmaputra River Rejuvenation Authority by restructuring Brahmaputra Board. · The Prime Minister announced to make North East the organic capital of India. · For attracting talented students from NER, Government announced “Ishaan Vikas” scheme providing exposure visits for internship in IITs, NITs, NIFTs. · Under the initiative of DoNER At Doorstep – officers of M/o DoNER visit each State on rotation basis. · The Prime Minister dedicated to the Nation Unit-II of 726 MW gas based Palatana Power Plant in Tripura on 1st December 2014. · For broad-basing and nurturing the sporting talent of North East, Prime Minister announced Sports University in Manipur. · On 18th January,2016, Sikkim has been declared as First Organic State in the country. 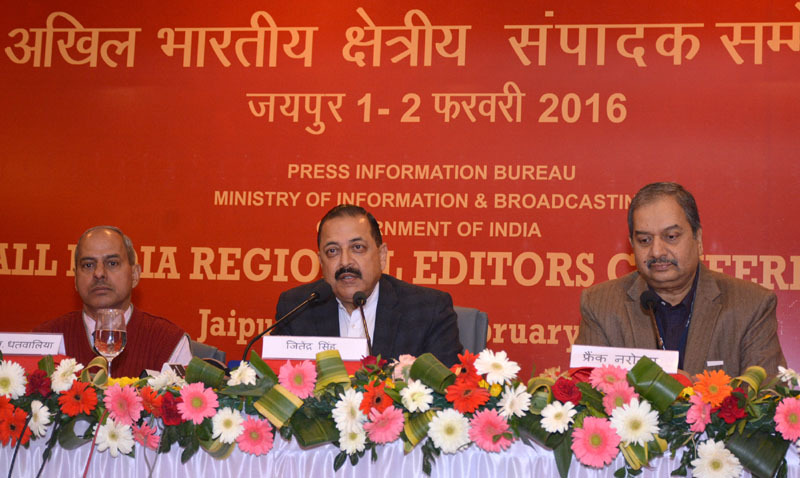 Dr Jitendra Singh also interacted with the editors and answered their various queries and discussed the initiatives of the Ministry. The Minister also briefed about the festival “DESTINATION NORTH EAST-2016” which is being organised by the Ministry during 12-14 February, 2016 in New Delhi to showcase the inherent economic, social and cultural strength of the North East Region at National Level. This Festival “DESTINATION NORTH EAST - 2016” will display various facets of North East in its myriad forms and colours through events as the proposed mega events. The event will include theme specific Business Summit consisting of sectors like, Tourism, Agriculture, Food Processing, Skill Development & Entrepreneurship, IT, Handloom & Handicrafts, Livelihood, Micro-Finance and Start ups.